If Hillary Clinton ends up being the Democratic Party’s nominee for president, her politics won’t be the only thing many Republicans and Democrats disagree about during the coming campaign. The two parties have sharply different perspectives on whether Clinton is religious – as they do about Bernie Sanders and some of the Republican candidates. But what makes Clinton stand out is that views of her religiosity have changed significantly over the last nine years. About two-thirds (65%) of Americans who identify with or lean toward the Democratic Party say they see Clinton as “very” or “somewhat” religious, compared with 27% who say she is “not too” or “not at all” religious. But among Republicans and Republican leaners, these figures are almost exactly reversed: 65% say she is not religious, while just 28% say she is at least somewhat religious, according to a new Pew Research Center survey. Overall, this adds up to an American public that is split in its view of the role of religion in Clinton’s life. Roughly half of U.S. adults overall (48%) say Clinton is at least somewhat religious, while a slightly smaller share (43%) say she is not religious and 9% express no opinion. Compared with an earlier point in the 2008 election cycle (when Clinton last ran for president), Americans are now considerably more likely to see her as “not too” or “not at all” religious and slightly less likely to say she is at least somewhat religious. Overall, far more Americans now express an opinion on this question than did so the last time we asked this question about Clinton in August 2007. At that time, during the lead-up to the Democratic primary that Clinton eventually lost to Barack Obama, 53% of U.S. adults said Clinton was at least somewhat religious, 24% said she was not religious and 22% did not express an opinion. This shift has been especially stark among those in the GOP. Roughly four-in-ten Republicans (43%) said in 2007 that Clinton was “not too” or “not at all” religious, a figure that has grown to 65% today. And the share of Republicans saying Clinton is at least somewhat religious has fallen from 37% to 28% over that period. 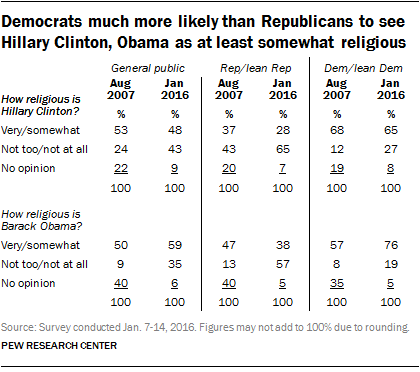 Though Democrats are no less likely to say that Clinton is at least somewhat religious as they were in 2007 (65% today, 68% then), they have become more likely to say Clinton is not religious (12% in 2007 vs. 27% in 2016). There are similar patterns in views about Obama, although differences between Democrats and Republicans have grown even more sharply over the last nine years than they have for Clinton, who was better known than Obama by the U.S. public in 2007 following her years as first lady and in the Senate. In 2007, Republicans and Democrats saw Obama’s level of religiosity slightly differently; 47% of Republicans and 57% of Democrats said he was “very” or “somewhat” religious, while 13% of Republicans and 8% of Democrats said he was not religious. More than a third in each party said they did not know. But over the course of his years as president, Republicans have become less likely to see Obama as religious and dramatically more likely to see him as nonreligious. A majority of Republicans (57%) now say he is “not too” or “not at all” religious. Democrats, meanwhile, have become much more apt to see Obama as a religious person. About three-quarters of Americans who identify with or lean toward the Democratic Party (76%) say Obama is at least somewhat religious, up from 57% in 2007 and roughly four times the share of Democrats who now see the president as nonreligious (19%). Perceptions about a candidate’s religiosity matter, although by how much depends to some degree on party identification. For example, roughly half of all Americans (51%) say it’s important to have a president who shares their religious beliefs. However, sharing beliefs matters more to Republicans (64%) than to Democrats (41%).